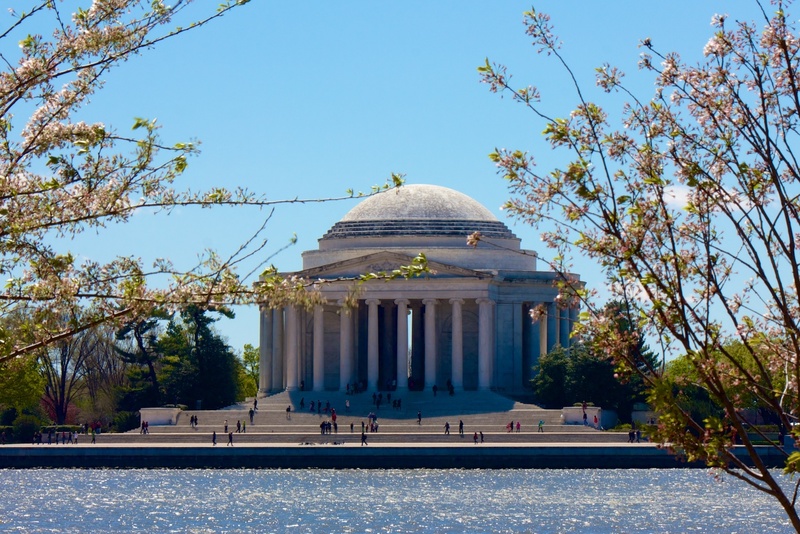 Many visitors overlook the attractive, stately Thomas Jefferson Memorial; in fact it receives less than half of the visitors seen at the Lincoln Memorial. 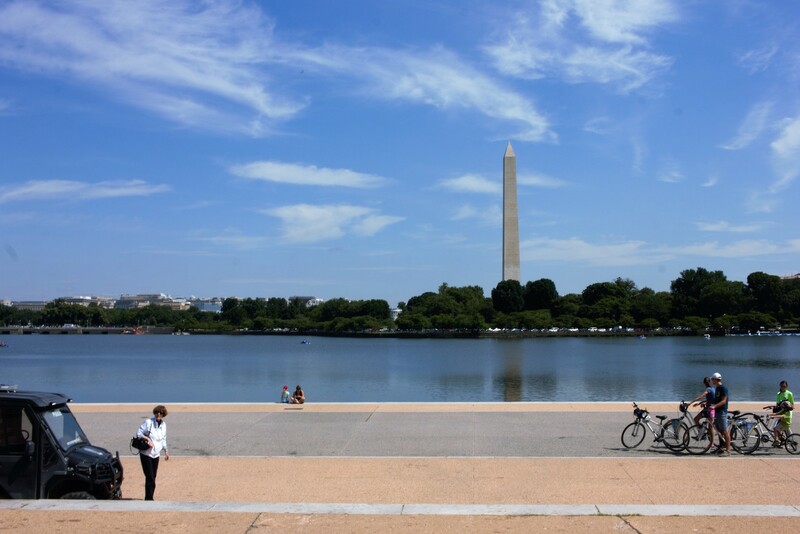 Despite being adjacent to the National Mall – just across the lovely Tidal Basin – its comparative separation deters many tourists. 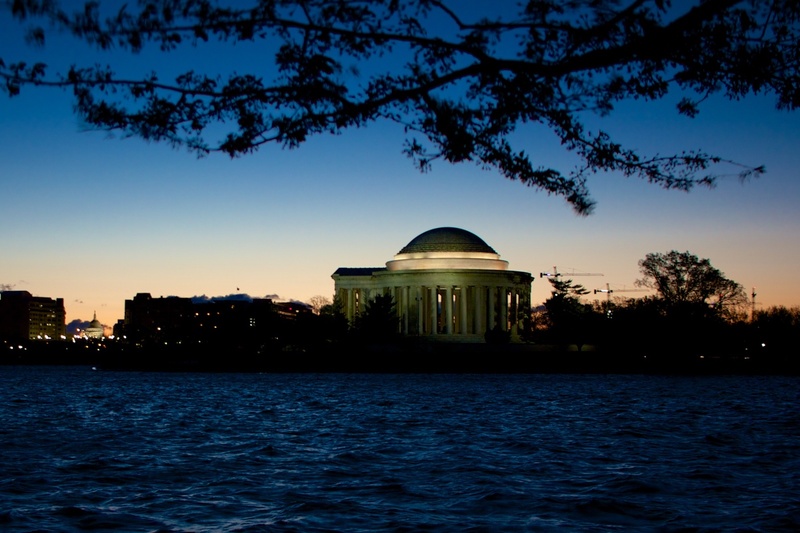 Do not let it deter you, however, as the astounding design and relatively tranquil setting are worth the trip around the basin. 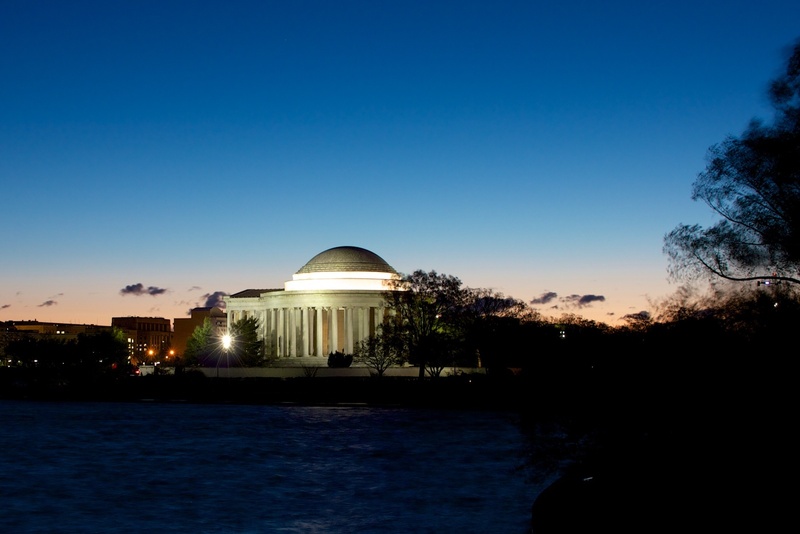 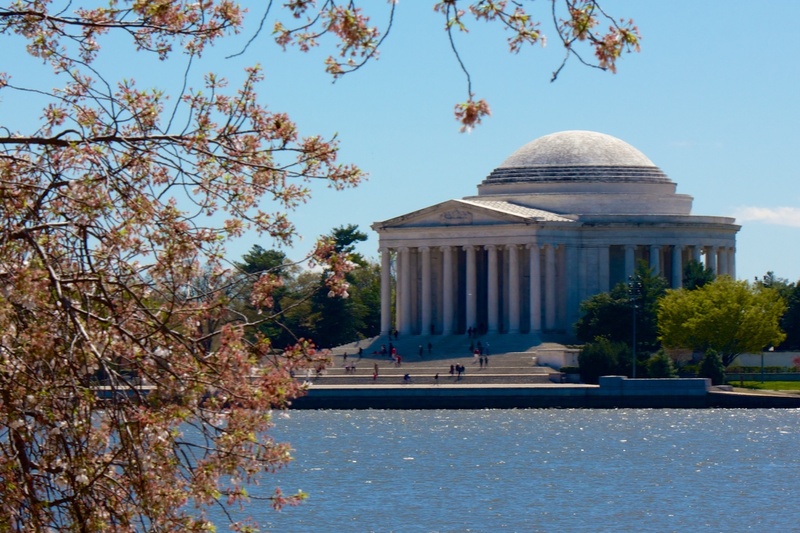 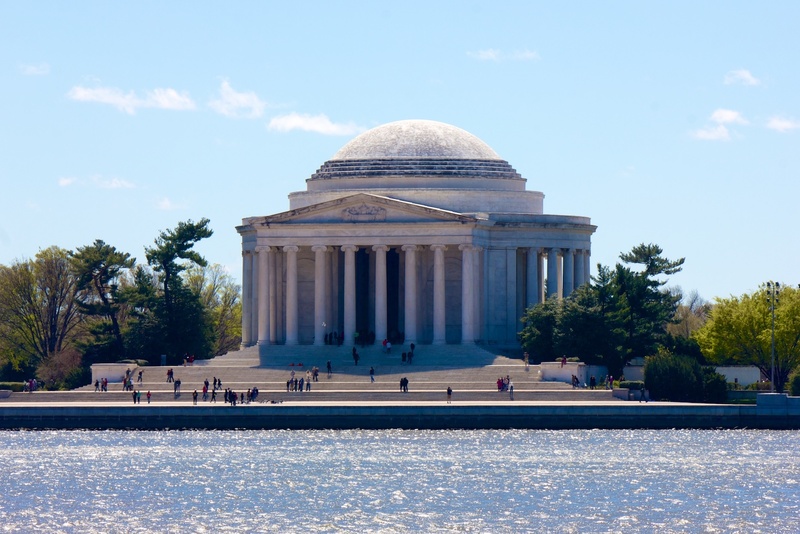 The Thomas Jefferson Memorial is an open-air, circular, domed, 165-foot wide structure supported by a total of 54 columns. 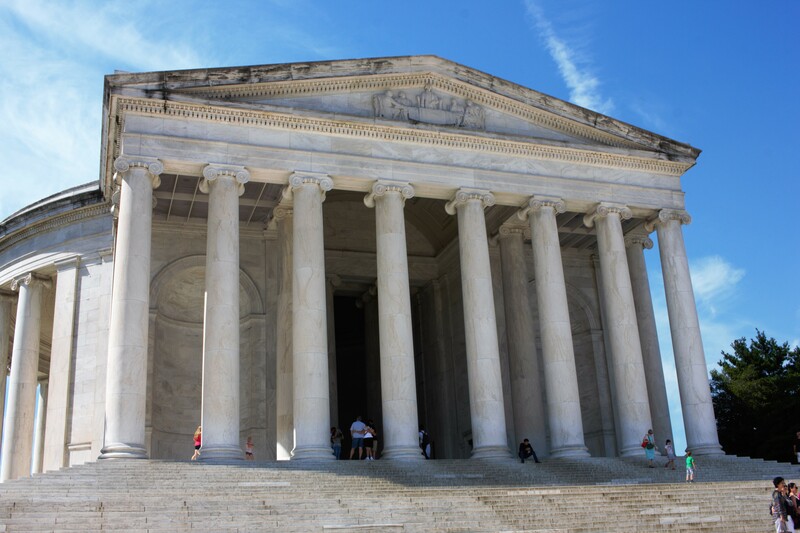 It is augmented at its main entrance by a 102-foot wide, triangular portico. 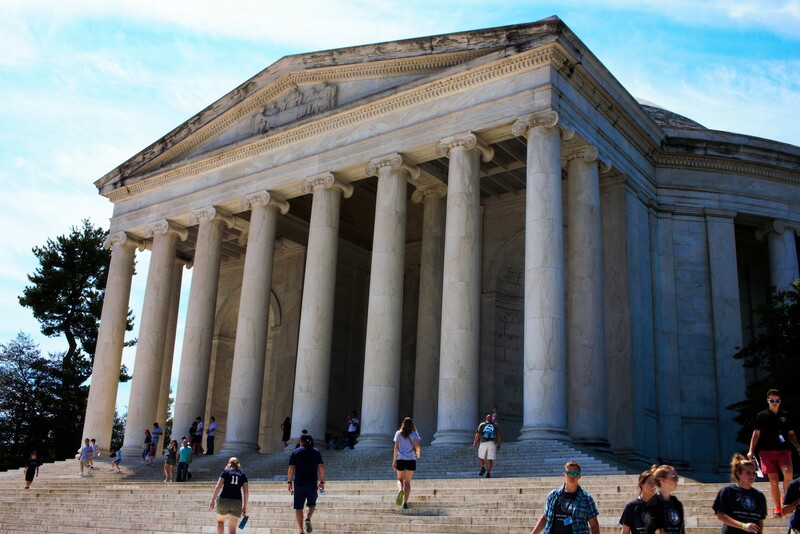 While both neo-classical and charming, the design is also very similar to the Rotunda at the University of Virginia – a building designed by Thomas Jefferson himself. 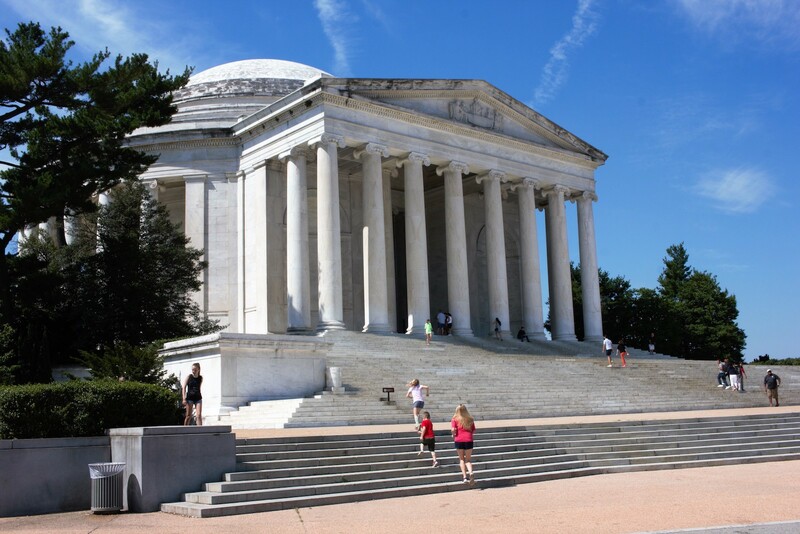 There may be no better method of tribute than allowing President Jefferson to indirectly design his own monument. 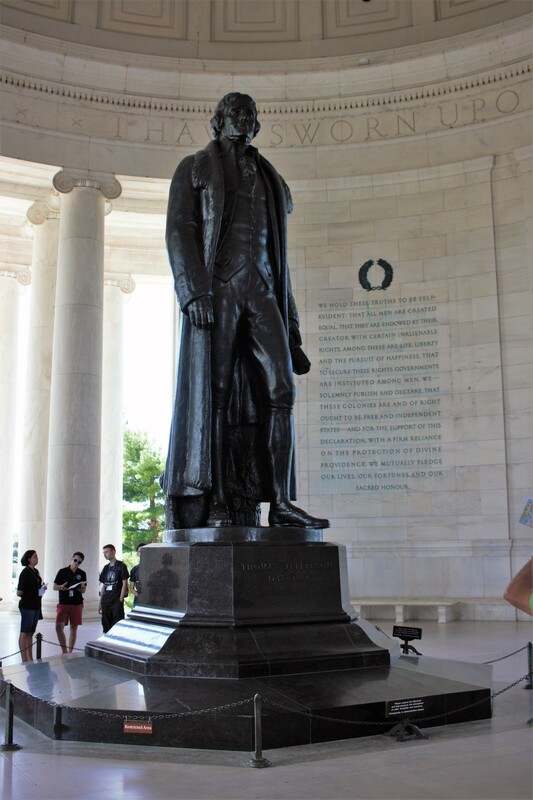 The interior naturally features a statue of the President, in this case a 19-foot tall bronze sculpture of Thomas Jefferson standing casually with a content smirk on his face. 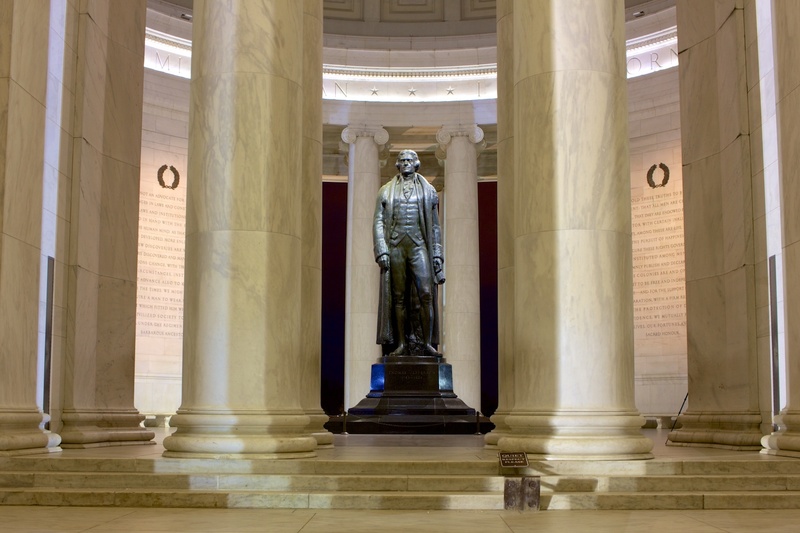 The area all around the statue is a work of art, constructed of two different kinds of marble – walls of white and a floor of pink – with a dome made of limestone. 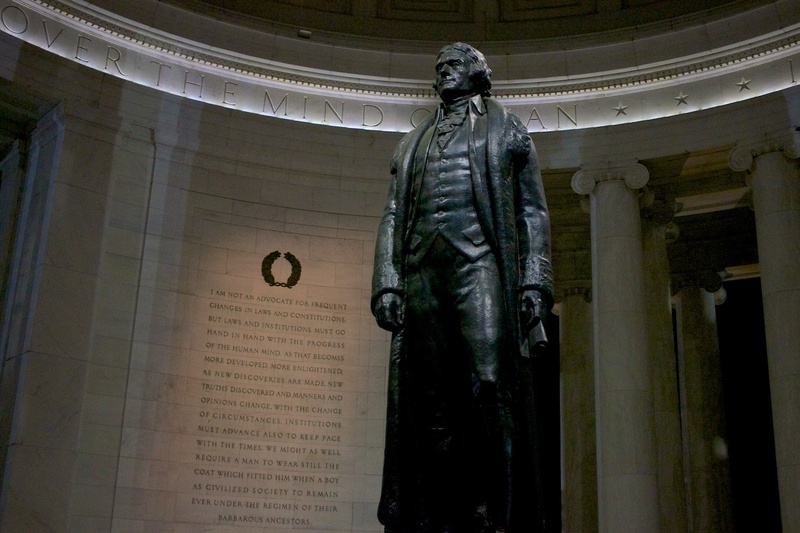 The quality and detail throughout are beautiful, as are the Thomas Jefferson quotes that adorn just about every surface. 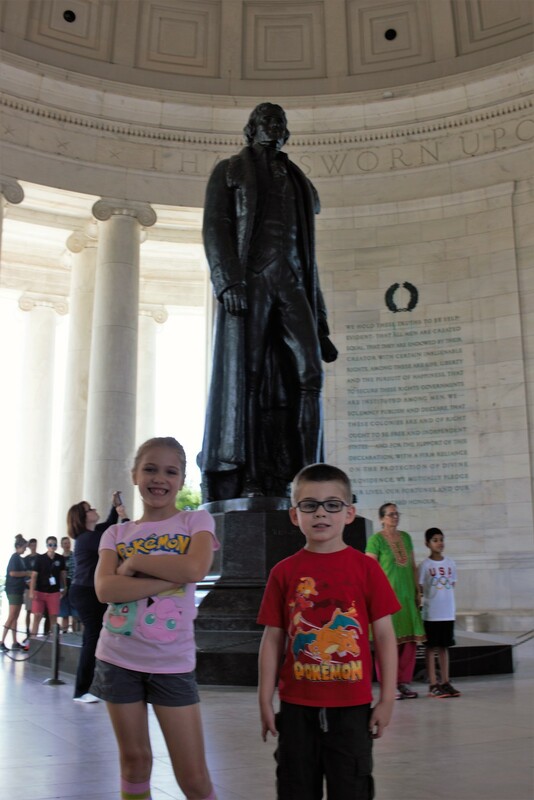 The quotes are taken from many different documents and pieced together to give an overall impression of President Jefferson’s ideals. 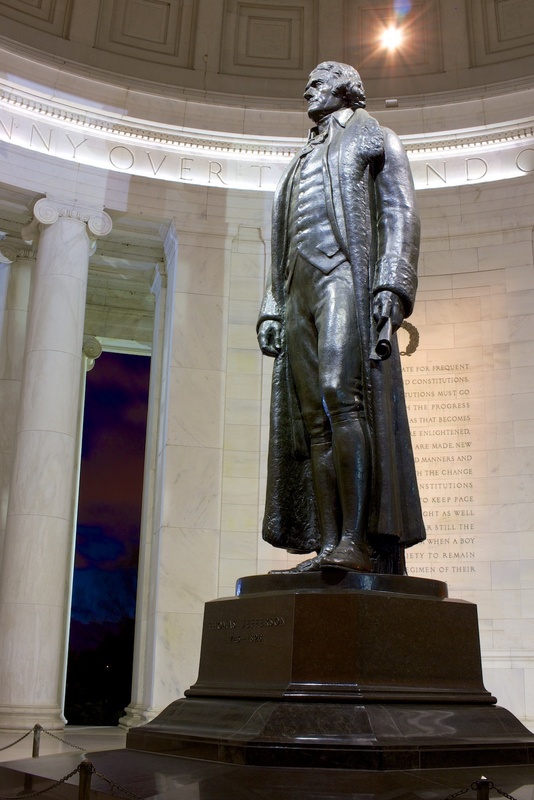 The Declaration of Independence, A Bill for Establishing Religious Freedom, and several personal letters and writings are used, sometimes within the same quote. 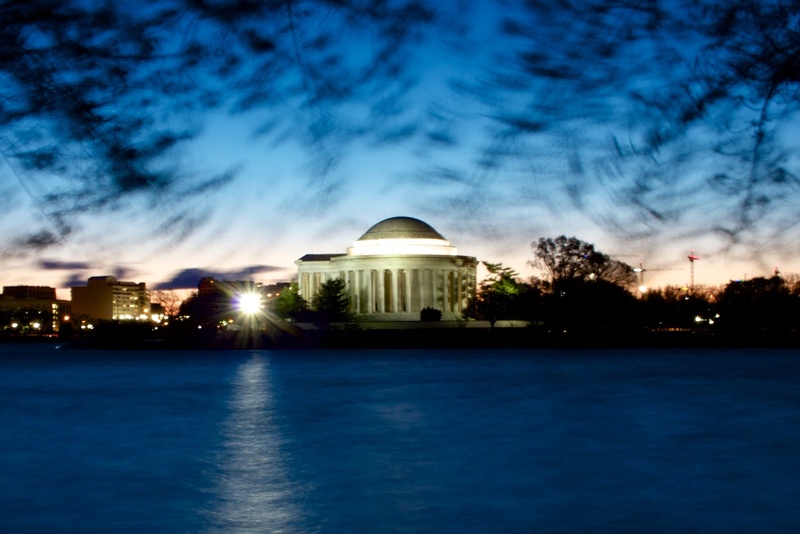 The message certainly comes through, even if the source is a bit muddled. 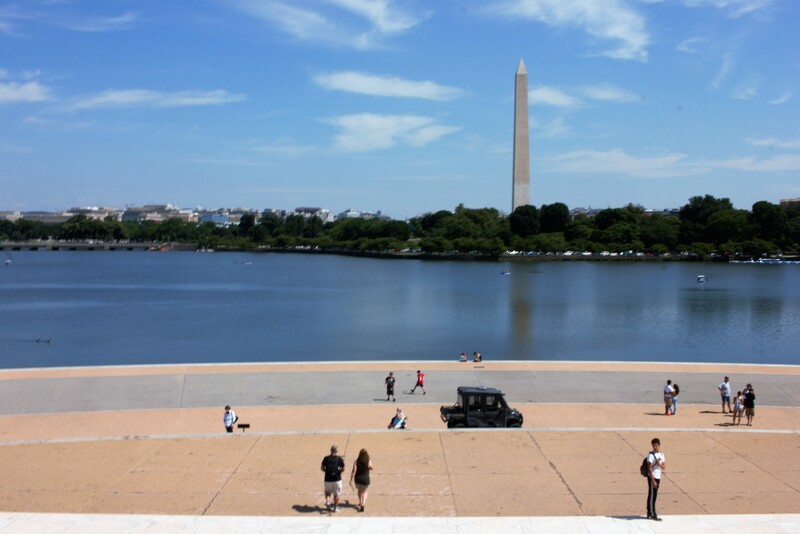 Equally as stunning as the monument is its setting: on the shores of the Tidal Basin. 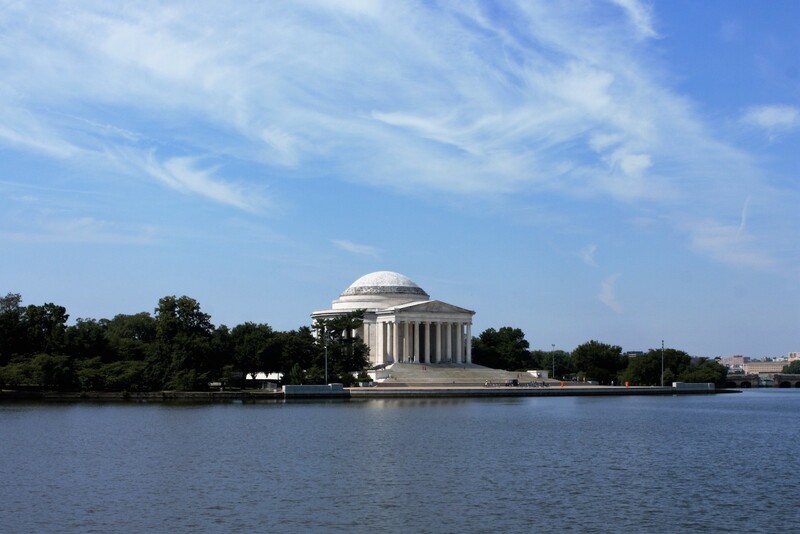 The exact spot was chosen because it is in a direct line with the White House, thus completing the “four point” plan of the National Mall – Lincoln Memorial to Capitol, White House to Jefferson Memorial, with the Washington Monument as the fulcrum. 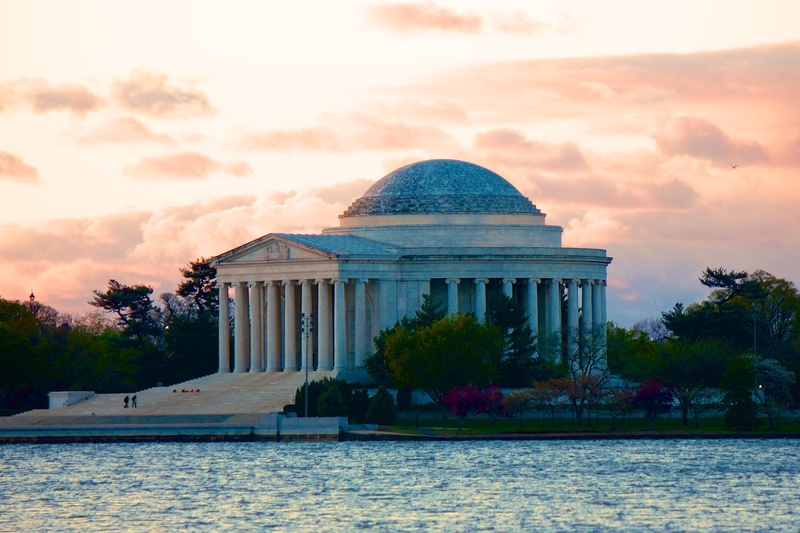 From the steps of the Jefferson Memorial, a wonderful vista sits before you of the basin, the Martin Luther King, Jr. Memorial, the White House (through some trees), and the Washington Monument. 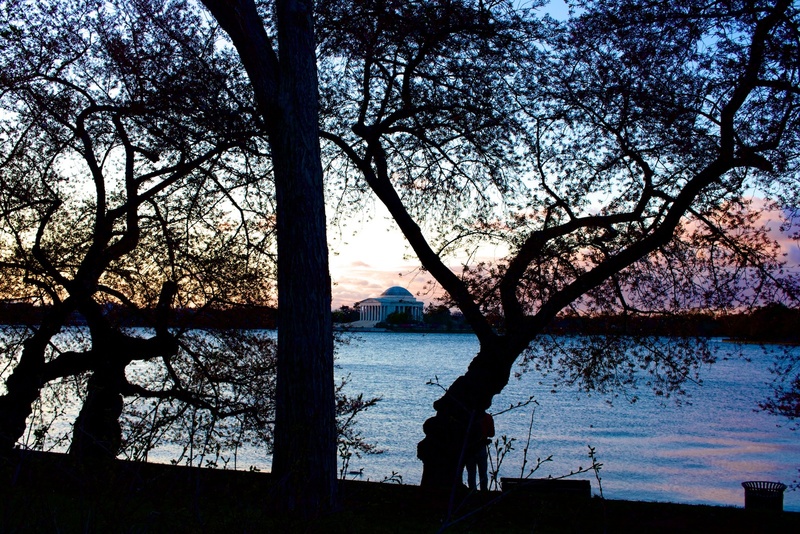 The blooming of the cherry blossom trees that surround the Tidal Basin gives the entire area a gorgeous pink glow, although those blossoms bring the crowds with them. 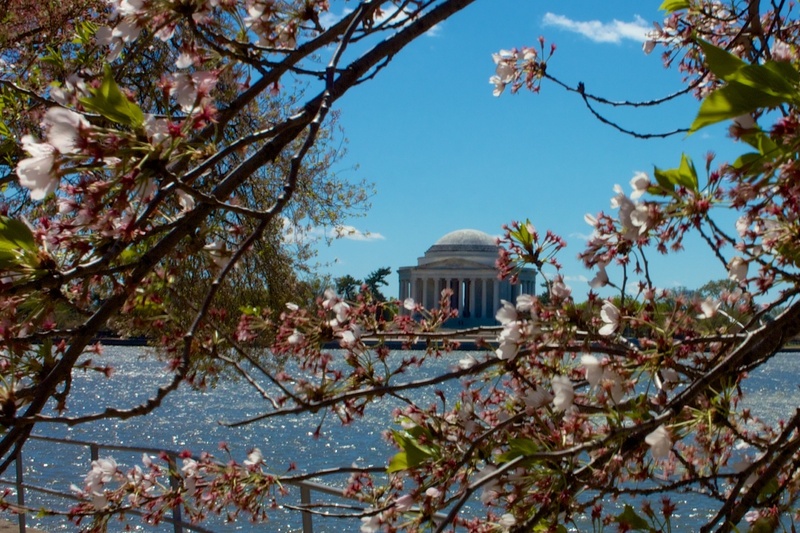 If you are visiting during the Cherry Blossom Festival (late March to mid-April) go earlier in the day.